Every month FontShop make a font available for free for a limited time so grab it while you can. The best option is to join their monthly newsletter so you don’t miss one! Ralph is behind the excellent Inconsolata font which is great for printing code or if you like large programming fonts. He also has a number of classical typefaces including the great ATF Century Catalogue, Museum Caps, LeBe, ATF Bodoni and ATF Franklin Gothic. A bunch of licensed fonts available from Ascender Corporation including the stylish Kooteny and sharp Miramonte. Jos has produced a number of beautiful typefaces free to download. I particularly like the subtle quirks of Delicious and the flowing curves of Fertigo (sample shown_ but also check out some of the others available too. These fonts were previously commercial and designed for the Greek alphabet and the four fonts available – Canonica, Cosmetica, Modata, Moderna – look great in the Latin alphabet too. A number of experimental fonts for download but not redistribution including the rather delicious Engel Light ltd. These people produce a number of great free fonts including the elegant COM4t Fine Regular and Quilline Script Thin. If you love typography then check out the ILoveTypography blog for news on great typefaces and tips on designing your own font. * some restrictions apply to usage on some of the fonts, check the licences for details. 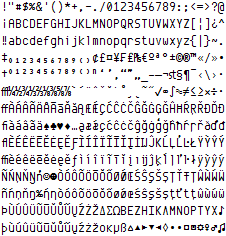 Palm OS – a Window port of the Palm OS system font recreated from screenshots. I also have about 20 pixel fonts from my Spectrum days that I am intending on bringing across to Windows FON format in the near future. 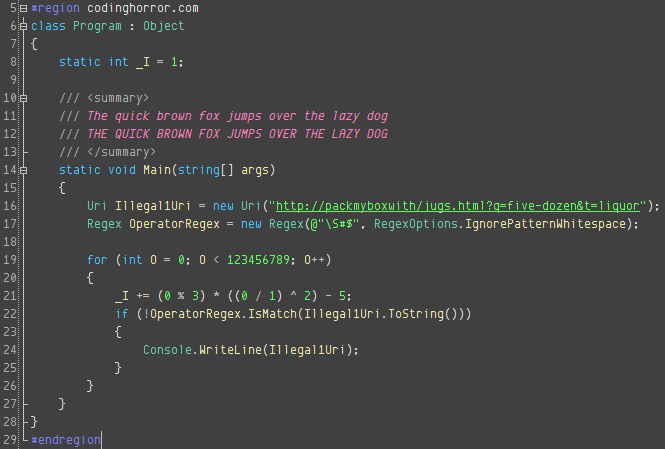 Jeff “Coding Horror” Atwood published a nice round-up of coding fonts he’s been looking at lately in Visual Studio with his own color scheme. For reasons best known to Jeff he went with 11 point this time (previously his scheme was published with 10 point) and used the older preview of Envy Code R neglecting to mention the italic-as-bold variant to get round the no-italics limitation of Visual Studio’s highlighting syntax editor. The last few days have been frantic ones putting the final touches to the next release of the Envy Code R typeface as I bring it closer to my idea of the perfect coding font. Many glyphs have been redrawn, curves improved and a many additional characters and symbols added bringing the number of glyphs to 461 – enough to cover common European and US code pages including Windows/ISO 1250 & 1252 as well as MacOS Roman and a few others. 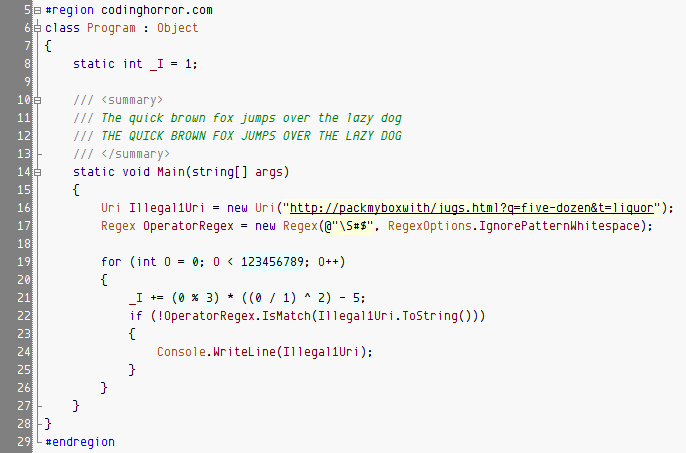 As a bonus I’ve created a variant that overcomes Visual Studio’s aversion to italics by marking the italic font as bold. Choose ‘Envy Code R VS’ in the Font and Colors part of Visual Studio’s Options and choose bold wherever you want italics. Download of this older version no longer available.